But worldwide, governments were shocked by a new stand taken by the U.S. government. 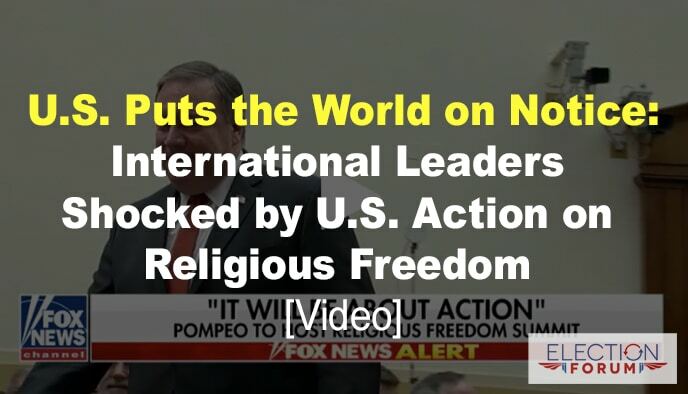 For the first time ever in U.S. history, the U.S. has both a Secretary of State … Mike Pompeo … and an Ambassador-at-Large for Religious Freedom … former Kansas Governor Sam Brownback … who both believe protecting religious freedom should be a top priority in U.S. foreign relations. Their goal is to show other countries around the world that when they protect and promote religious freedom, it improves their security … and benefits their countries economically. How will Pompeo and Brownback accomplish this goal? The State Department released its 2017 International Religious Freedom Report under the direction of Sam Brownback. The report provides guidance on the work that needs to be done to convince countries around the world that promoting religious freedom is in their own national interests. Mike Pompeo announced he will host a religious freedom summit later this year. It will be his first event with world leaders … and it will be on religious freedom. It demonstrates to the world his top priority as Secretary of State. In the past, the U.S. has been deaf to the cries for help from persecuted religious groups. “Where fundamental freedoms of religion, expression, press, and peaceful assembly are under attack, we find conflict, instability, and terrorism. On the other hand, governments and societies that champion these freedoms are more secure, stable, and peaceful. Three words – Amen, Amen, Amen!! Do not forget what is happening here in our own country. Excited to hear this. Love how Pompeo has reminded all what brought the pilgrims here from England and how this country is founded on religious freedom. God has blessed this country because we honored Him. We have become stiff necked and thrown Him aside. We need to get back on track or He will deal with us by allowing more conflict, terrorism and instability. Amen…Amen..,Amen. We/I will continue to share these info to my sisters and brothers in Christ. I love America and I supported our President Donald Trump. In church we prayed for President Donald Trump. I gladly join in the amen and will continue to pray for our leaders and our country. It is past due time that we stand for our Christian values. Thank you Mr. Pompeo, President Trump, Mr. Pence and all who stands for Him. Yvonne! Your right, America is a stiff necked nation & has turned from its godly foundations. Only true individual repentance can save one, if they truly live righteously & endure until the end. Yes! America has been blessed but no longer. The hand writing is on tbe wall & judgment is coming for us, as we continue to kill the unborn, & so much more. We are guilty for the blood of the innocent. It is great that we have some leaders who stand for religious freedom, but that doesn’t mean they will change the course of a nation. When Prophet Jeremiah said Babylon was coming to kill, destroy, & scatter & enslave Israel, there was nothing that could be done to stop it. So is it with America. Through Pres Trump & others God’s judgment has been delayed but it is coming. It is interesting that in Luke 21, Jesus said that when you see all the end times things happening to pray they stop & look to your leaders to change things. NO NO! Jesus said to pray to live worthy enough to be protected by God & that you may be strong to stand in the coming persecutiin for Christ. Jesus said its coming & you can’t stop it. Press into personal holiness or you will never see God, even if you do all the Christian stuff. Check yourself! Are you truly following Christ with your whole heart? Ponder this & may God open your eyes to understnd the TRUTH!